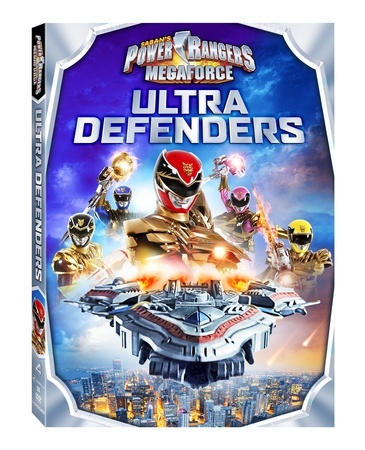 Earth is in serious danger and it is up to the Power Rangers Megaforce to defend it in Power Rangers Megaforce: Ultra Defenders, arriving on DVD, Digital HD and Video on Demand June 17 from Lionsgate Home Entertainment. When menacing robots attack using a powerful weapon, the Megaforce team looks to the sixth Ranger, Robo Knight, along with Rico the Robot to help fend off major destruction. With over four million viewers watching each week on Nickelodeon, the Power Rangers series continues to lead as the #1 boys live-action series. Featuring four action-packed episodes from the 20th season, Power Rangers Megaforce: Ultra Defenders will be available for the suggested retail price of $14.98. When the powerful but dangerous Aurora Box gives mutants Bluefur, Bigs and Dream Snatcher one hundred times their normal strength, it’s up to the Power Rangers to stop their destructive rampage! When the evil robots Metal Alice and Rotox attack, the Power Rangers Megaforce must rely on Robo Knight and their new ally, Rico the Robot, to prove that humans and robots can work together! One of you can win a copy of this DVD. Please feel free to enter using the Rafflecopter form below. Ends June 30, 2014. Good luck! would give to my kids. thank you for the giveaway. My son would love this. He’s a big Power Rangers fan. I hope I win. Thanks. I would give this to my friends little boy. He will be turning six soon and would love it! Both of my boys would really enjoy watching the Power Rangers DVD! Thank you so much! My 7yo, he is a huge PR fan…so much so that he says when he’s grown up he will be the Red Ranger! I’d give this to my little brother! He adores power rangers! I would give this to my son – he would absolutely love it! Thanks for offering the chance to win! I would give this to my nephew. He loves the Power Rangers. Thank you for the review and giveaway! I would give this to my kids. Thanks for the giveaway! I am excited. I hope I win the prize.